Need a new Chainsaw, Earth Auger, Garden Blower, Brushcutter, Hedgecutter, Petrol Mower, Ride-on Mower or Flail Mower the contact us for a special deal. We are suppliers for Efco, Stihl and Kubota to name a few. Are you clearing out the Barn or Garden shed ? Do you have Garden or Agricultural Machinery that you have no need of anymore, why not Trade it in or earn some Cash from it. Do you need Garden or Agricultural Machinery for a one off job? We supply everything from a 12 Ton Muck Spreader, Tracked Wood Chipper or Mini JCB to a Petrol Mower, Stimmer or Chainsaw. We acquire all different models and makes of mowers and machinery from part exchange deals. New Second-hand Ride-On Mowers in Stock! Recently here at TSW, we have sorted through our Ride-On Lawn Mowers in our yard and decided to sell a few of our second-hand stock. After a service and sharpen, they are ready to go. 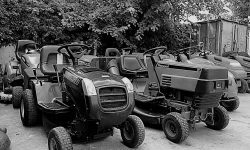 Check out the list of Second hand Ride-on Mowers here.